Congratulations on the new addition to your family! Raising a child is a rewarding experience to be sure. For the first few months of their life, you will be feeding them either formula or breastmilk, depending on your preference and your baby. 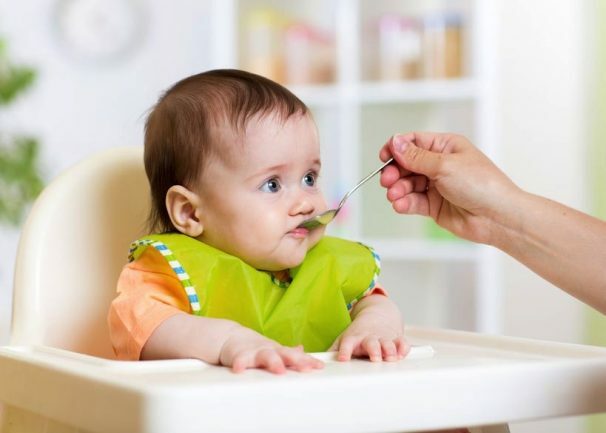 However, at a certain point, you will need to feed your baby some baby food. There is premade baby food in jars you can purchase from the store, but what if you don’t want to? The good news: it is relatively simple to make healthy baby food in the comfort of your home. Aside from the ingredients, all you need is a high quality blender and containers to store the baby food in! Fruits and vegetables are the best choices for making healthy baby food—but should you serve it raw? No! The first rule when it comes to making baby food in a blender is to cook the fruits and vegetables, even if you don’t think you need to (e.g. cook things you’d normally eat raw, like peaches). The exact cooking times and temperatures will vary based on the specific fruits and vegetables, as will the method. Perhaps the most popular ways are roasting the fruits and vegetables in the oven or boiling/steaming them in a pot on the stove. If you want to roast them in the oven, we suggest using a cookie sheet so to cook a decent amount at once. Roasting a whole, unpeeled sweet potato will take a long time in the oven (it will also take a long time to boil). Thus, we recommend chopping the fruit or vegetable into small pieces before cooking. You can save a lot of time this way! It also makes it easier on the blades in your blender, since it takes less effort to blend smaller pieces. Once you have cooked and cooled the fruits and vegetables, you will need to blend each until smooth. You can, of course, do combinations, but you may also wish to just do one type at a time (e.g. all sweet potato without any other vegetable mixed in). Keep the blender running until you have pureed the fruit or vegetable completely smooth—this is best for babies (texture can come a little later on, but blended is best at first). Now, pureeing the fruits and vegetables is only half of the task when it comes to making healthy baby food in the blender. You need to add flavour! Popular choices include cinnamon, mint, basil, curry, and oregano. You might want to start with smaller amounts, particularly with a choice like curry, as your baby gets used to it. Adding these spices is a great way to introduce flavour without adding sugar or salt, neither of which is particularly healthy for babies (if introduced early, and in high amounts, children can become reliant on these artificial ingredients). Of course, the basis of healthy baby food is in your ingredient choice. You want to make the food full of things like sweet potatoes, carrots, apples, peaches, et cetera. You really want to have an array of fruits and vegetables so you get the array of vitamins and minerals they offer—all to help your growing baby. Spinach, for instance is chock full of vitamins, particularly iron. Different fruits contain things like antioxidants and vitamin C, and carrots are a significant source of beta carotene, which the body converts to vitamin A. Remember, a variety of ingredients is key to making healthy baby food!